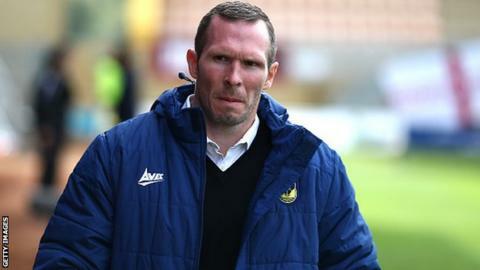 Oxford United boss Michael Appleton admits he is happy to finally have some stability in charge of a club. The 39-year-old endured difficult managerial spells at Portsmouth, Blackburn and Blackpool before moving to the Kassam Stadium in July 2014. One of his former sides Portsmouth visit Oxford on Saturday looking for their third win of the season. "Going to Portsmouth halfway through the season, I never really got chance to do any recruitment," he recalled. "It was a difficult period the 12 months I had down there," Appleton told BBC Radio Oxford. Portsmouth were relegated from the Championship under Appleton in the 2011-12 season and he said of the following campaign: "I came back and we had two professional players in the whole building. "Moving on, the Blackpool and Blackburn experiences were through the season so I have never had the chance to bring my own team," he added. "We had a good summer, good recruitment, good pre-season and a steady start to the season," he said. Oxford's key midfielder Kemar Roofe is an injury doubt for Saturday but the U's will welcome back Liam Sercombe from suspension.